Although we are having another reluctant summer there is still a great range of herbs, flowers and vegetables to take advantage of this time of year. Whilst it is in season I eat asparagus most days. Although it is usually best simply steamed or blanched (maybe with some butter or a poached egg) it is nice to try a different way of serving it now and then. I adapted this recipe from Nigel Slater’s book Tender, which I enjoyed because it manages to create a complete dish out of asparagus using a variety of flavours, without drowning out it’s fresh taste. 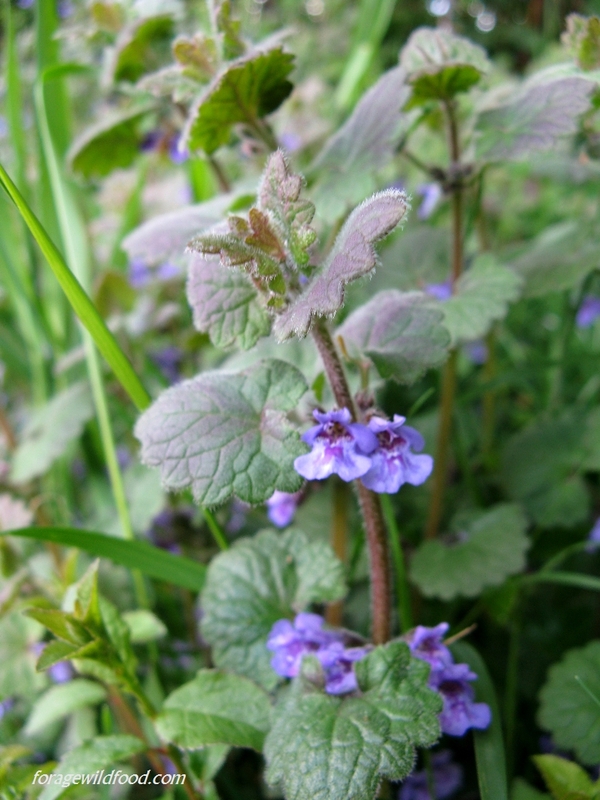 I substituted the mint with ground ivy (Glechoma hederacea) which is in flower now, it can be found in meadows often hugging the edges by trees, as it enjoys the semi shade. Ground ivy also grows in small patches in woodland where the leaves grow larger to compensate for the lack of light. It has a strong flavour which is slightly minty but also quite unique, and makes an excellent tea. I had not tried cooking with it before, and although some people can find it too intense raw it worked really well used liberally to flavour this dish. The spring onions were replaced with ramsons, just added at the end to preserve the garlic taste. In place of parsley I used cow parsley (Anthriscus sylvestris), which must only be picked if you are able to differentiate it from it’s deadly poisonous relatives in the carrot family. 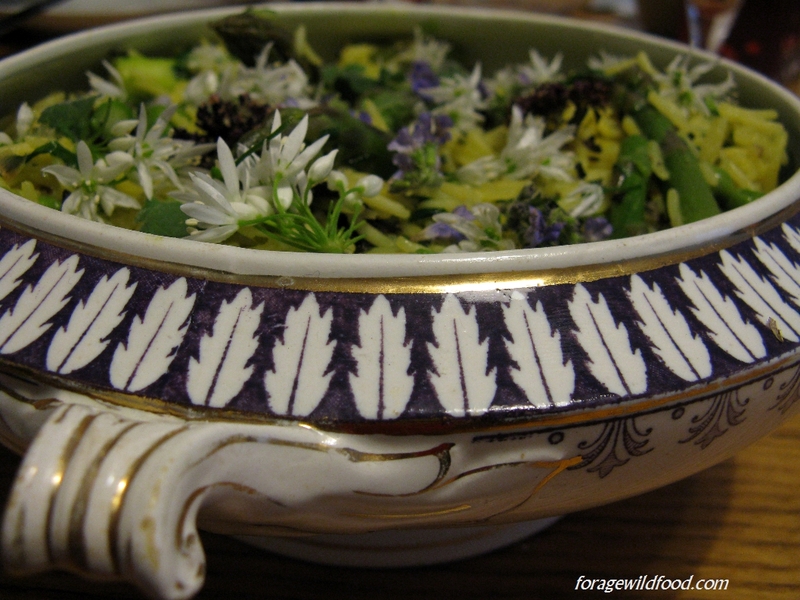 I also used some wild thyme and wild marjoram, and finished it with ramson and ground ivy flowers. Other flavourings used in the recipe in small amounts are cardamom and clove which add a delicate perfume to the rice along with saffron which also provides colour. The cloves could be replaced with wood avens (Geum urbanum) root boiled with the rice. Wood avens is common along the edges of wood and does well in urban environments, the leaf has little flavour but the roots tastes almost the same as cloves, although the taste is less concentrated. 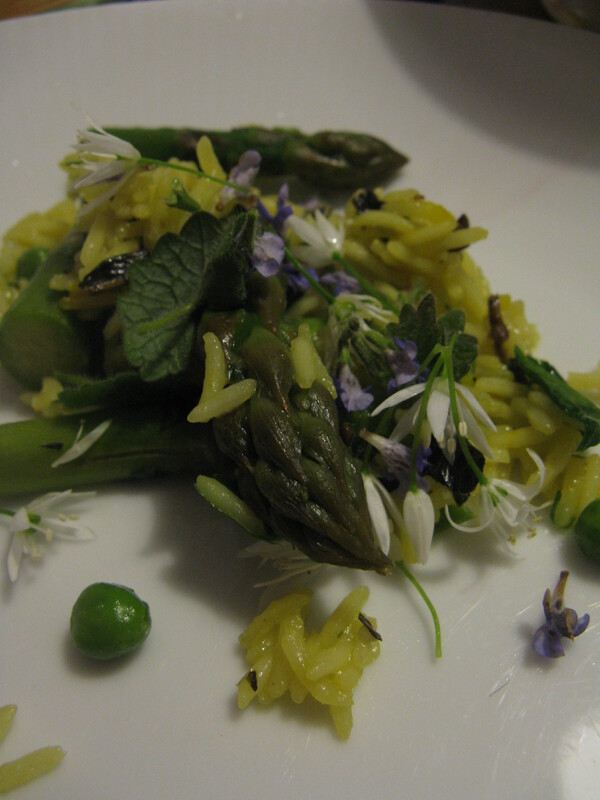 There are many other wild herbs and flowers out there that could be added to this dish, try experimenting! Looks really yummy as well as healthy, was it all from the Heath?